Polish Black Metallers BLAZE OF PERDITION are back with a bang to blow people away with their latest effort “Conscious Darkness” with a worthy successor to their 2015 album “Near Death Revelations”. The band has managed to almost recover from a tragic accident in 2013 that took the life of bassist Ikaroz and also left the vocalist Sonneillon and drummer Vizum severely injured as well. The band released their 2015 album being heavily affected by the incident and this album continues their journey in their reflections of that accident. While the band has added a new guitarist to their roost, the essence of the band has remained the same and they have picked up where they left off in 2015. The album promises to be more aggressive and is filled with heavier riffs and a darker sound that fits the premise of the album. The album has four with a runtime of just under 45 minutes. “A Glimpse of God” starts things off to a brutal start. The song sets the tone for a heavy and evil atmosphere and the vocals are tortured and dark in nature. The song has a catchy chorus and the song opens up with a sombre warning that God is only found through suffering. “Ashes Remain” is the second album and the longest. It is also the most memorable song of the album. The song also has the similar tortures vocals and boasts of a haunting melody. The clean vocals over the instruments lead a haunting after-feeling. “Weight of the Shadow” and “Detachment Brings Serenity” rounds off the album with both songs clocking less than 10 minutes. The melodies of the songs and the vocals mesh well and are furious and angry. Double-time bass is used generously to give the impressions of a wall of sound. The band has released a great record and their efforts have certainly reaped rewards. 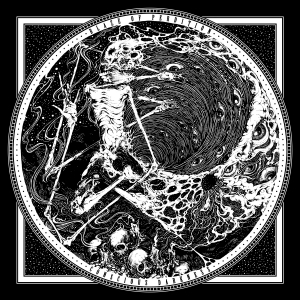 For fans of Black Metal, this album will definitely satiate their thirst for dark Metal music. The songs all connect to each other and the album is meant to listen as a whole. The band puts out the message of total rejection of Catholicism and we are left with a lesson in melancholia and death. For fans of the band, this album is not one to be missed. And for fans of the whole dark Metal genre, this is a band worth giving a listen to even though the band does veer into the experimental zone.